Ever make a decision that you regret? Here’s mine. When I bought my car, I forgot to buy a convertible. I can already hear you thinking, “what ARE you talking about?” Well, it’s summer, I’m in California, and I’m driving around, blasting Laurie Biagini’s CD Ridin’ The Wave on my car stereo. But I’m not doing it right–I need a convertible to give this shiny, summery music the proper treatment! 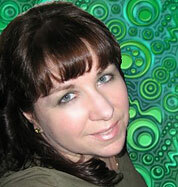 I am pleased to announce that Laurie Biagini is the Twirl Radio Artist of the Month for both June and July, 2009! I interviewed her on Twirl Radio on Saturday, June 20th, 2009. I first heard Laurie’s music on The Time Machine, based in Maui, Hawaii. Her infectious You’re A Dangerous Thing sounded so good coming out of my little computer speakers. I immediately begged her for some music to play on Twirl, and she sent me the entire Ridin’ The Wave album. I have since heard her music on Pop Garden Radio (Florida) and ShockPop Radio (North Carolina). Hmmm…Hawaii, Florida, North Carolina, and California. All sunbelt states with ocean beaches. It’s a great fit for Laurie, because my favorite description of her sound is “Karen Carpenter fronting the Beach Boys”. Her music is definitively sunny, and reminiscent of good time beach music from back in the 1960’s. If the Beach Boys had a kid sister who sang and played keyboards, she would sound like this. Laurie hails from Vancouver, BC, Canada–not a place you’d expect to be a hotbed of beach music. But her sensibilities are definitely 1960’s/1970’s-era Southern California. Her voice is warm and rich like Karen Carpenter. Her subject matter and some of her melodies bring to mind the Beach Boys, and her harmonies are reminiscent of the Mamas and the Papas. She told me in the interview that those artists, along with the Monkees and Jerry Lee Lewis, were indeed her greatest influences. Ridin’ The Wave is Laurie’s debut album. It starts off with the title track, an upbeat pop tune about grabbing that perfect opportunity–framed within the context of surfing and the beach. This sets up the rest of the album with her signature soaring vocal harmonies, and perfect pop melodies. The unusual thing about this song is the prominence of the guitar. Most of Laurie’s music is piano-based, and she is quite an accomplished keyboardist. Doin Nothin At All is one of the most fun songs on the album–and that’s really saying something, because the whole album is fun. It’s more typical of the Laurie Biagini sound–the piano and the organ sounds take the lead. The lyrics are great–encouraging you to take it easy, and forget the schedules, burdens, problems, and deadlines. And one of my favorites is Bambuzled, which turns out to be a tribute to Dennis Wilson of the Beach Boys. By the time I get to this song, I’m ready for Laurie to come pick me up in a red ’68 Camaro convertible, for our day at the beach. There are some songs covering more serious topics. A Face In The Crowd deals with trying to fit in with the “cool” people. Crazy On Me is about a person who’s had some kind of breakdown or crisis, and is acting pretty strangely. The aforementioned You’re A Dangerous Thing turned out to be the big surprise of the album for me. I thought it was a really clever tune about a guy who’s bad for the singer. As it turns out, it’s an even more clever song, literally about sugar. Laurie told me that sugar and sweets are medically bad for her, so she wrote this song and masked the subject with relationship references. Her upbeat music makes the darker subjects easy to listen to, but if you dig a little bit into the lyrics, you’ll find some keen observations. There are also a number of romantic songs–Away On A Cloud, Vancouver Rain, Under A Tropical Moon, and Two Feet Off The Ground, among others. I’m not a big fan of love songs on their own, unless the music itself has something to offer. In this case–the music offers the instantly-memorable melodies. Ridin’ The Wave is one sweet album–in every sense of the word. Sweet pop melodies. Sweet vocals. Sweet harmonies. Sweet keyboards. Laurie proves that this kind of music is back, and more vibrant and alive than ever. She’s working on a new one, A Far Out Place. I’ve heard sneak previews of a few of the new batch of songs, and so far, she’s got another winner on her hands! As for live performances, Laurie hasn’t played out all that much, but did have a nice gig at the International Pop Overthrow (IPO) festival last summer in San Francisco, and is scheduled for one of the IPOs in Vancouver this summer. She’s also got a club date or two on tap as well. She’ll be expanding her solo wizardry to include a band for at least some of these dates. Laurie Biagini’s music is the perfect accompaniment to summer. She’s been a staple on Twirl Radio for over a year now, and I’m looking forward to more of her classic sound, from the great beach city of Vancouver. A hearty, summery congratulations to Laurie, our Twirl Featured Artist for June/July 2009!